Last week we did a “staycation”, the idea of which is to stay home, ignore all of life’s other demands and simply enjoy your property and spend time together as a family. Tuesday I went shopping with my Mom. Wednesday Ty and I ditched the kids for a date night. Thursday I went grocery shopping. Friday we spent the entire day having an actual vacation at Cedar Point. Despite our inability to remain home for one week, we still accomplished almost half of what we had planned! Mostly, we worked outside. 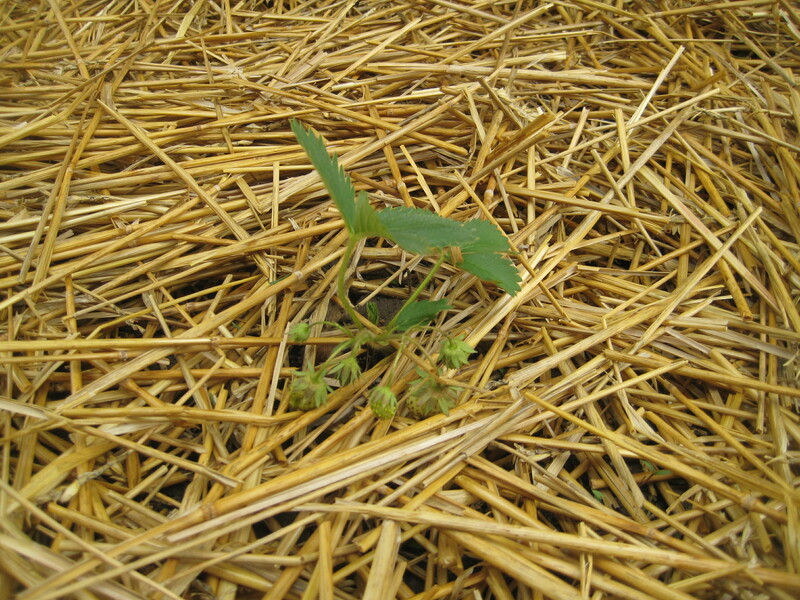 I planted my garden, which was a bit of a process. 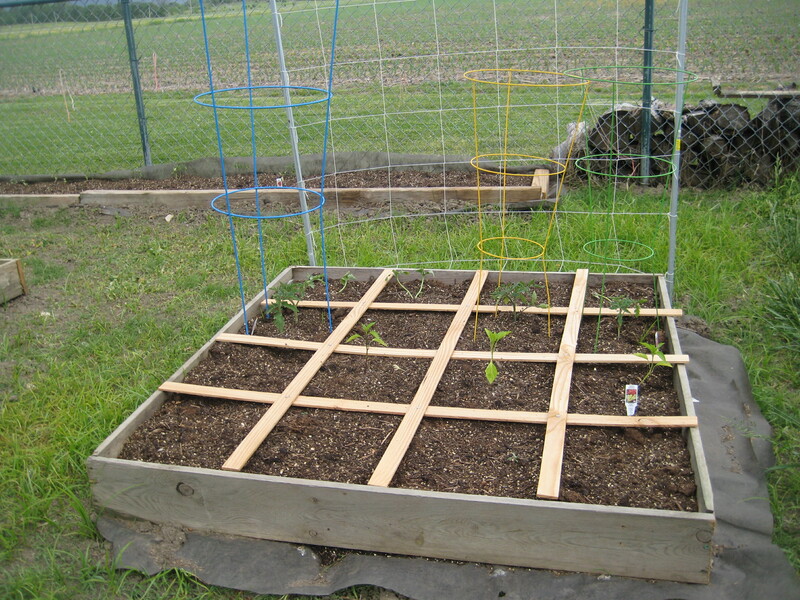 I decided this year, after failing MISERABLY last year in the fight against weeds, to try Square Foot Gardening. 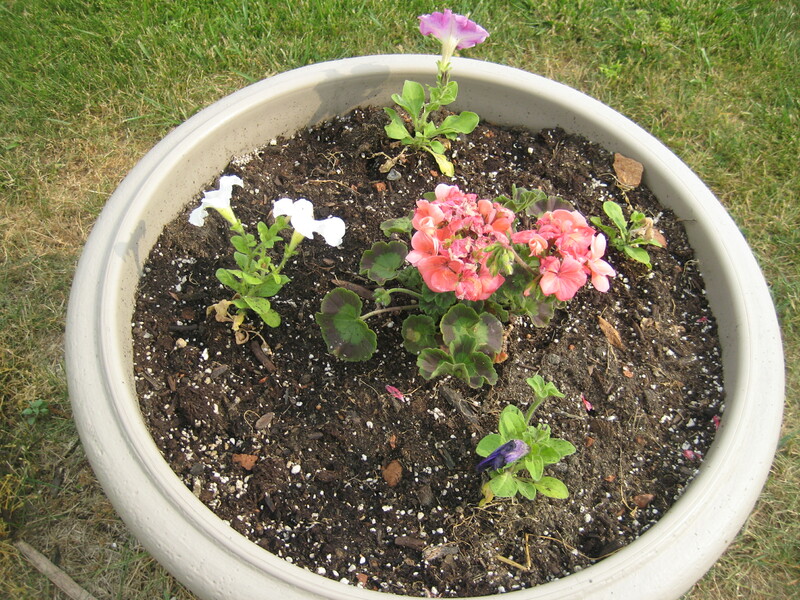 This particular method of gardening practically guarantees that I will not have to fight the weeds, especially if I go the extra step and replace my existing garden soil with “Mel’s Mix”, which is equal parts vermiculite, compost (from 5 different sources), and peat moss. Sounds easy enough, right? Once I located all the stuff it actually was fairly easy. 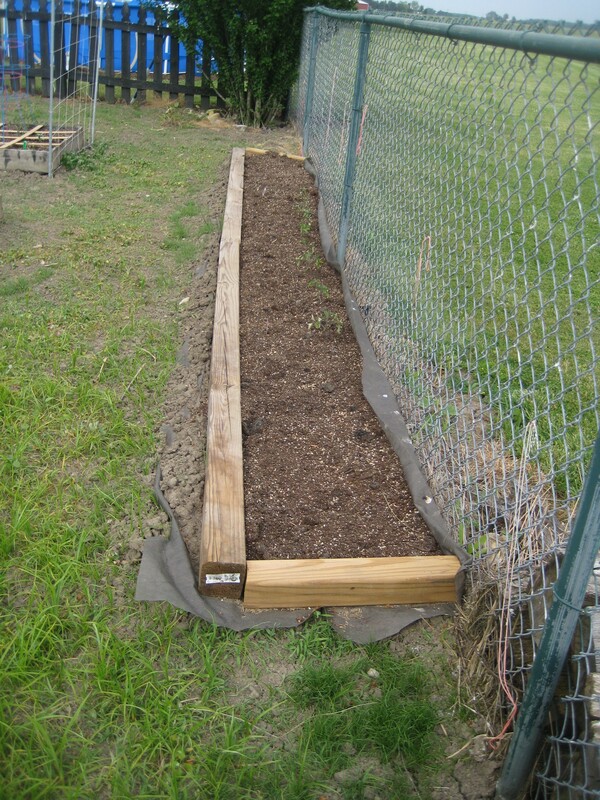 It was a bit tricky to find a reasonable price on the vermiculite and I miscalculated how much of each I actually needed TWICE so there was a lot of driving around, a lot of getting dirty, and actually a pretty decent amount of money invested in just setting up these raised beds. However, it’s all done and from now on I only need to add compost each year! It’s almost entirely planted (still need to plant corn, potatoes, watermelon, and pumpkin) and on it’s way to being gorgeous! 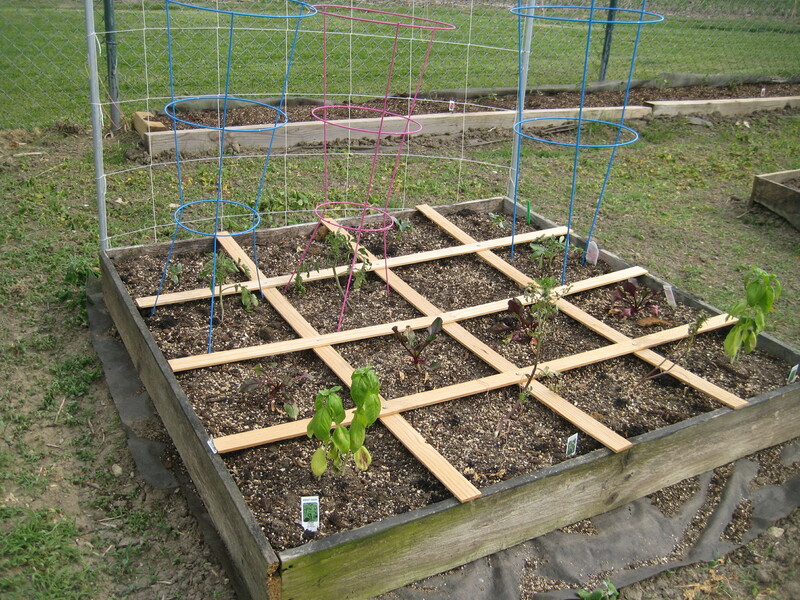 Cucumbers in the back 4 squares that will climb the trellis, more tomatoes ahead of those, then the rest of the squares are a mix of bush green beans, spinach, and snap peas that I don’t expect to spout because it’s been so hot here! This bed has 8 Roma tomato plants and romaine lettuce, and eventually will have 2 watermelon plants and 2 pumpkin plants that I will grow up the fence. I realize it isn’t much to look at and that I still need to trim that weed cloth, but believe me, it’s an improvement from the end of the season last year! I had foolishly decided that since I could handle a 20×16 bed in 2010, I could handle a 20×40 bed in 2011. Long story short, I couldn’t. So now we’ve seeded that giant bed, and by the end of the summer this year, the above picture will be much better looking. 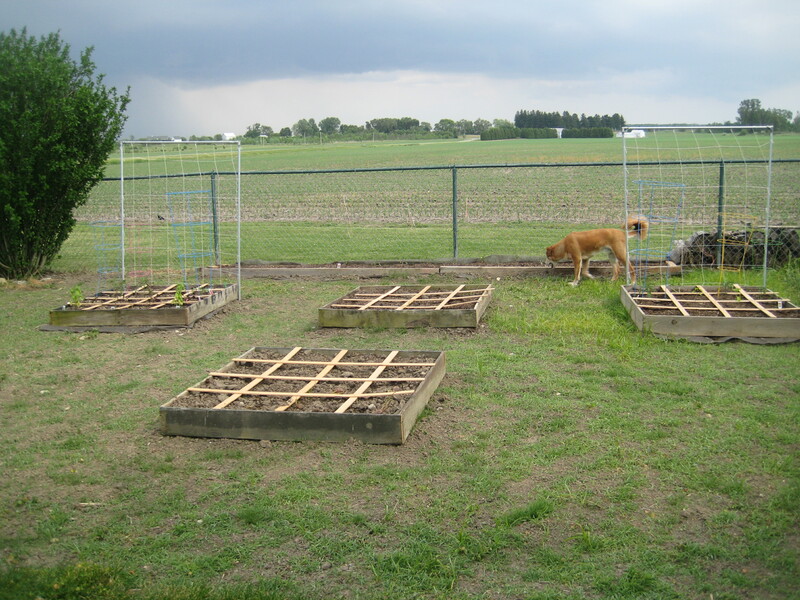 Hopefully there will be grass where there is dirt/weeds, and those sad-looking boxes will be overflowing with a healthy harvest! At any rate, I’m pretty thrilled to have it planted and growing! Mostly weeds. 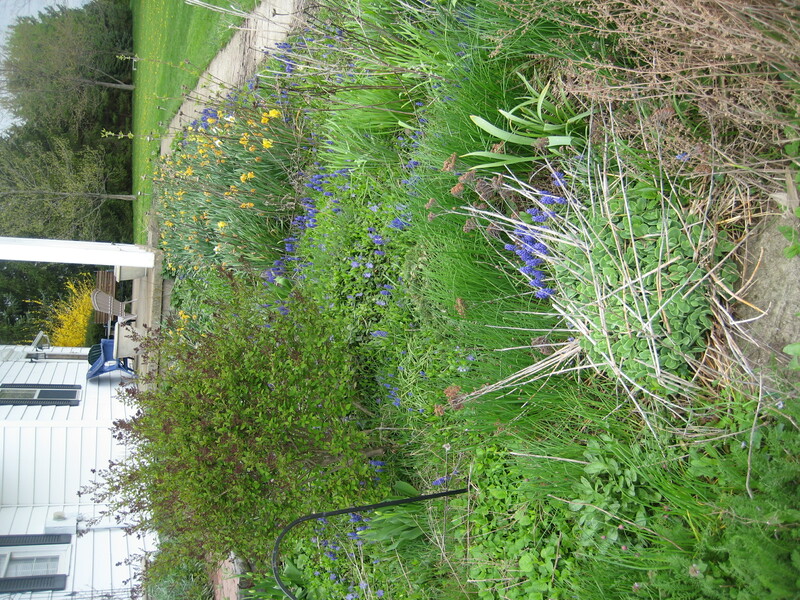 Some daffodils, a few perennials, some incredibly invasive and annoying ivy, lots of chives, and several good patches of poison ivy. No, thank you! Yes, please! Eventually it will be filled in with more color, and I did plant some annuals that should blossom and take up some space, but even with just the mulch down I am so happy! To think, I can actually walk down my sidewalk without being scratched by overgrown plants! The daffodils should still come up next spring, but if they don’t I did reserve a lot of the bulbs that I can replant, because those are beautiful when they come in! 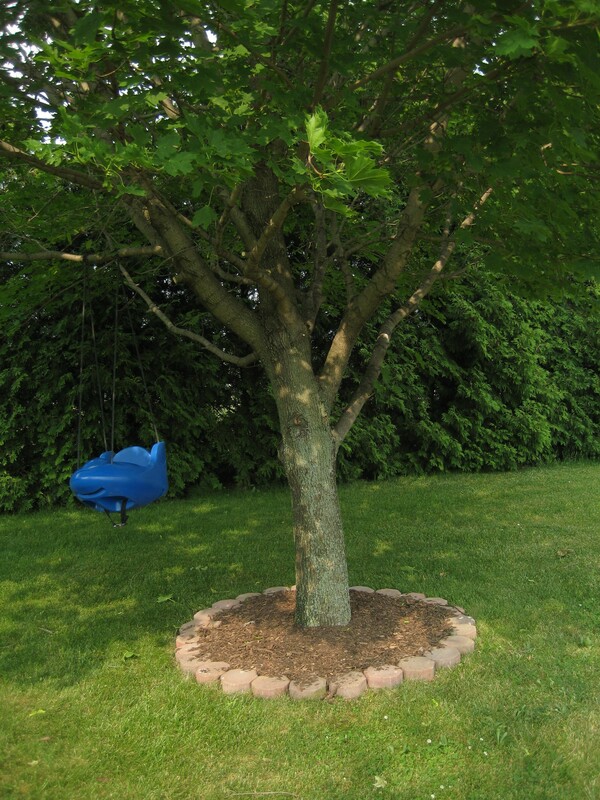 We used some pavers from a different project to encase three of the trees in the front yard and filled them in with mulch. Ty also trimmed the trees to head-hight so he can mow around them without getting concussions. They look beautiful! 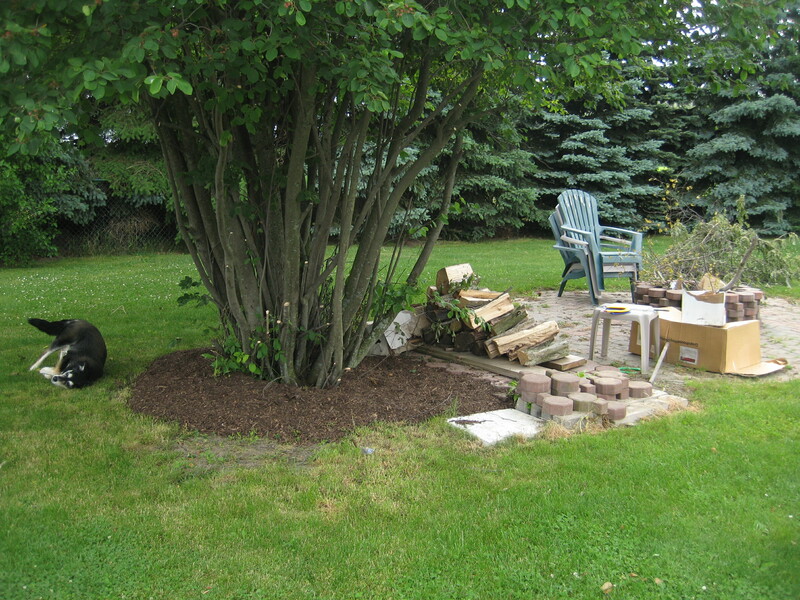 Ty trimmed up the tree next to our fire pit and mulched around. The black mutt is Mica, the rotten girl dog. 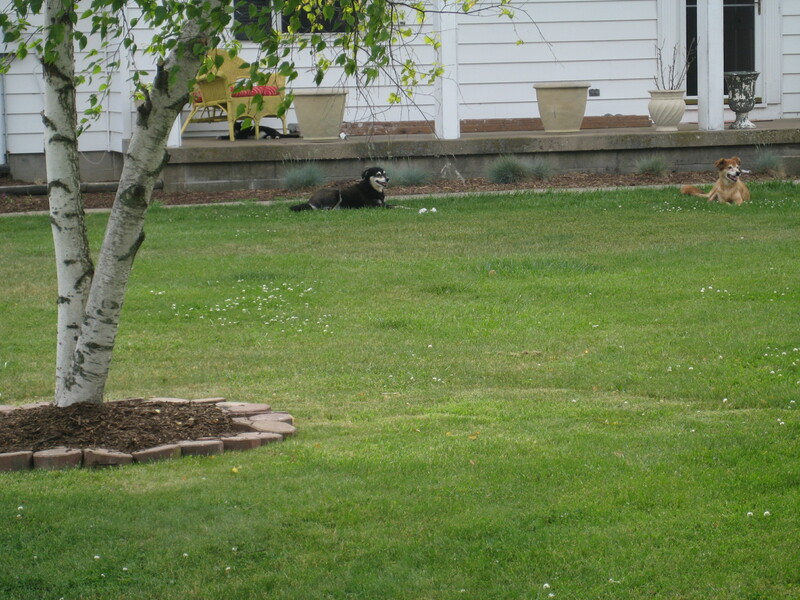 After I snapped this shot I realized what she was doing, which was rolling in another animal’s feces. And people wonder why I’m a cat person. Cats would never do that. Dogs are gross! Filled three of my pots with annuals! I can’t wait for these beauties to fill out! 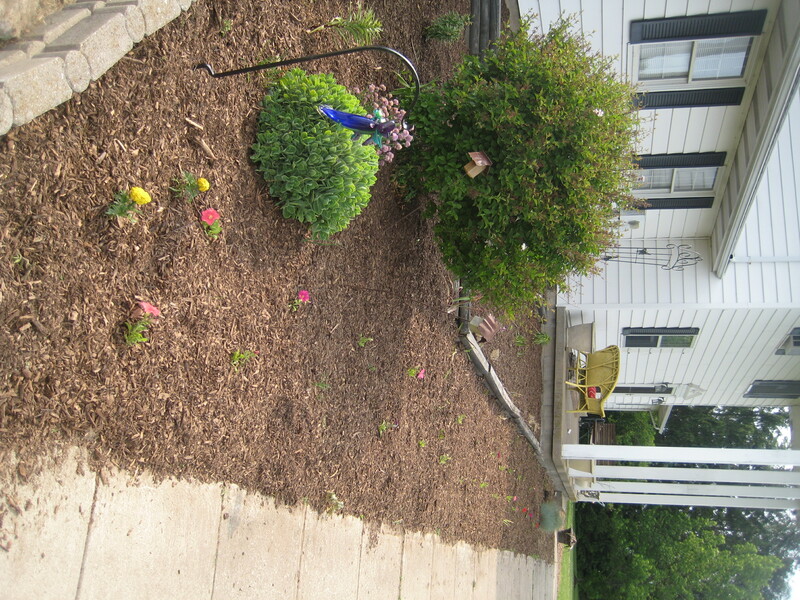 I weeded and mulched the back of the house. 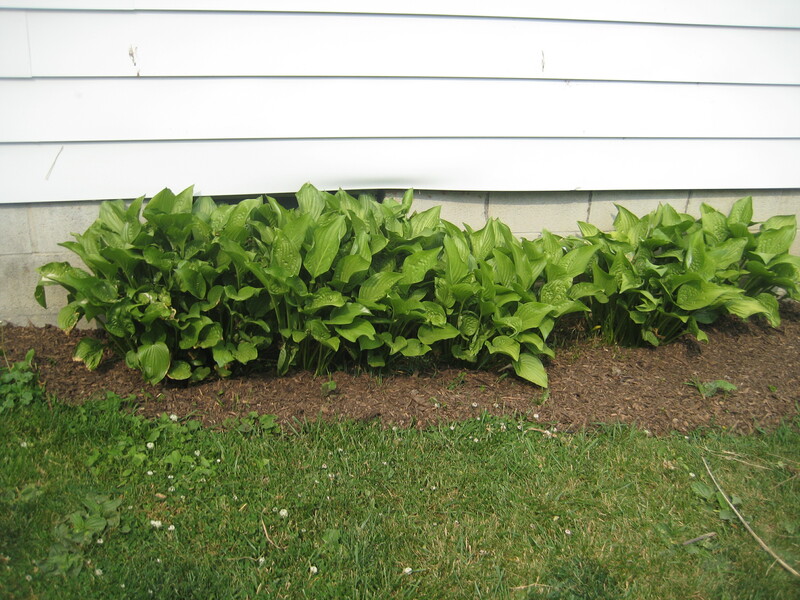 It looks great to see just hostas and not a pile of weeds! 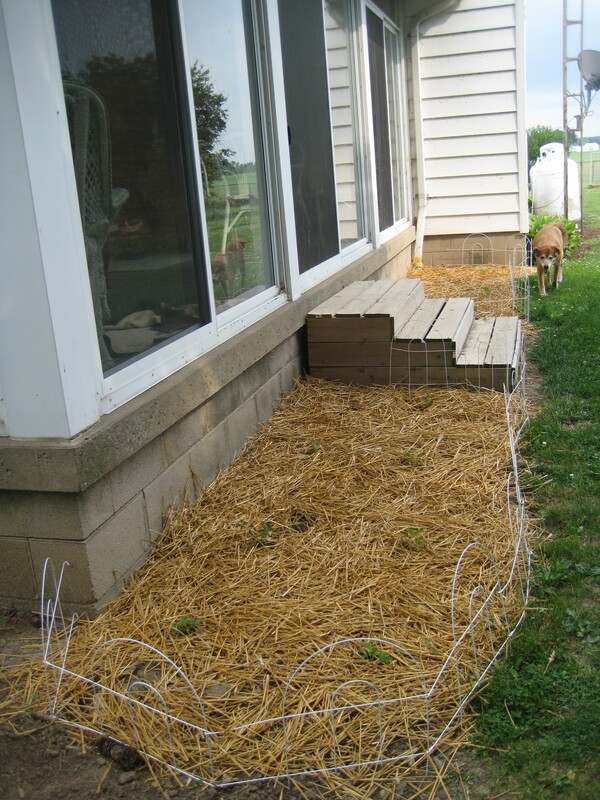 Cozy and I planted 8 ever-bearing strawberry plants and mulched with straw. Some of the plants already have berries on them! I think I’m supposed to snip them, though so they’ll have a bigger yield…need to research that. 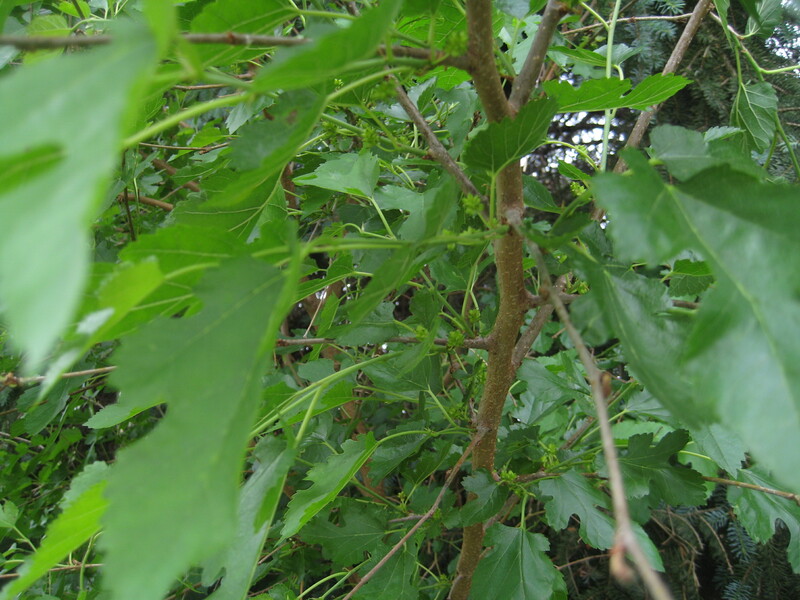 One of our Mulberry Trees has some blossoms! This is our third summer in this house, and the first one that we’ll get mulberries! I know most people don’t get excited over a “weed tree”, but I’ve always loved mulberries, and summer just isn’t summer without purple-stained toes!